600 Stories or Bust! 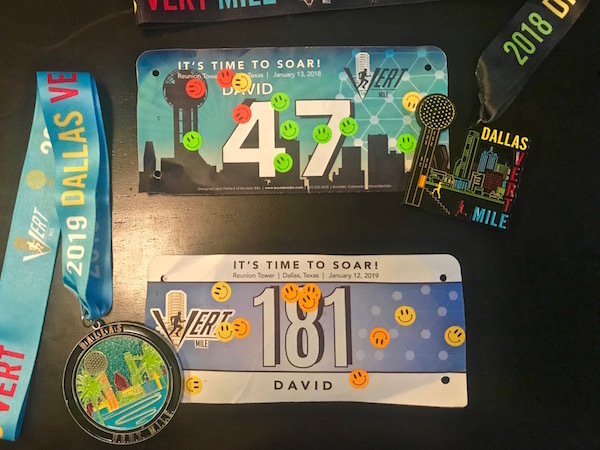 (2019 Dallas Vert Mile Race Recap) | Keep It Up, David! 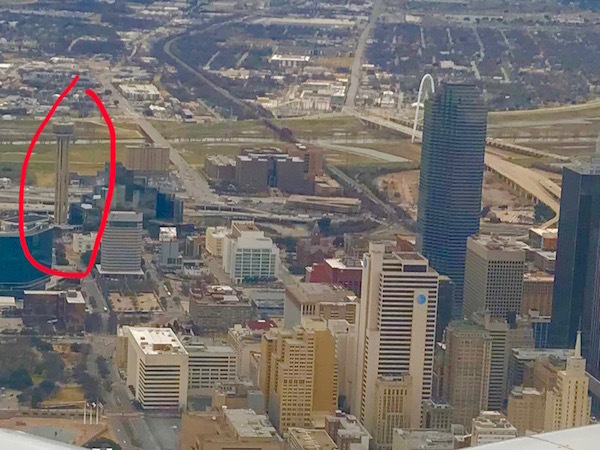 The Dallas Vert Mile had been on my calendar for months, but a pre-race knot formed in my stomach as I landed in Dallas on Saturday, when I saw the tower outside my plane’s window as it descended into Love Field. The tower is 561 feet tall, and the stairwell I’d be racing inside it is 50 stories, with 807 steps. The goal of the race was to see who could climb it 12 times (the equivalent of a vertical mile) the fastest. That’s why the knot formed – it’s even more challenging than it sounds! This race petrified me last year. It was the longest race I had ever signed up for, and I wasn’t sure, for weeks leading up to it, if I would be able to finish. But I trained hard, and when the day came, I did all 12 climbs. This time around, it wasn’t the fear of the unknown that worried me – it was the fear in knowing exactly what I was in for. I woke up at 4:15am and started my pre-race fueling: bananas and coconut water for potassium and natural sugars, and a protein shake. 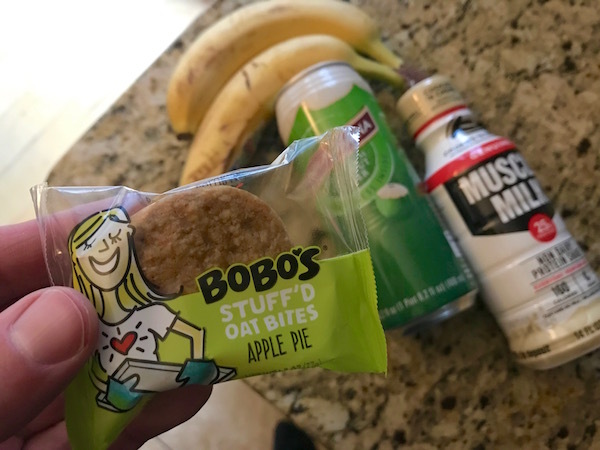 I added something new to the mix for this race, a 140-calorie Bobo’s oat bar. It was filling but not heavy, and apple pie flavored without being overly sweet. A smart choice. The race began promptly at 6am, with one racer starting every 10 seconds. I positioned myself near the back of the line and cheered on my friends as they systematically disappeared into the stairwell. You can see the first few steps through the door. That’s my friend Dan awaiting his start. It became crystal clear, very early on, that this race was going to be a lot harder for me than it was last year, for a variety of reasons. I wasn’t as prepared as I was last year, and hadn’t done as much stair-specific training. I was about 10 pounds heavier than I was a year ago. I had been sick for nearly a week, a week before the race, and still had a mild cough when I showed up that morning. And, to top it off, I had a headache, that I’d had, off and on, for the past few days. 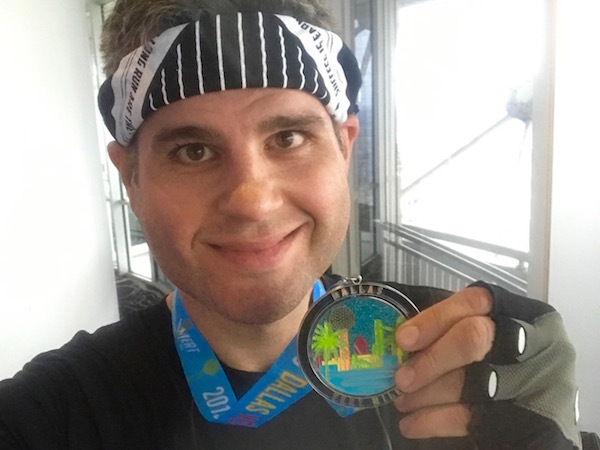 I was beat at the top of the first climb, even though I had tried to pace myself, and made a conscious decision, in that first elevator ride back down, to embrace the positive. It was the only way I’d get through the rest of the morning. So, for the rest of the two and a half hours, I climbed. 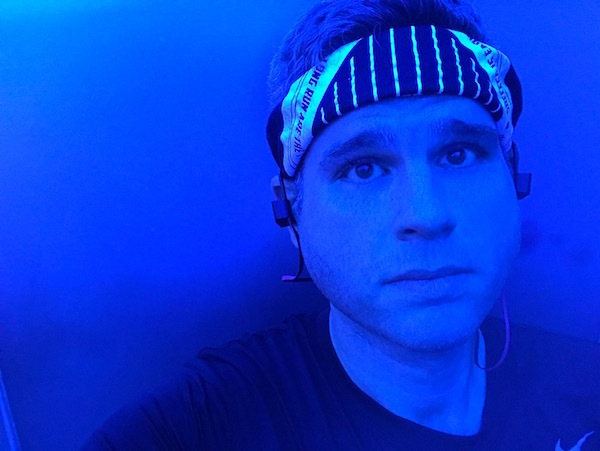 My energy faltered, and then crumbled, and the pain and soreness in my legs increased, and my lungs started crying out in protest, but I climbed. And, all the while, I focused on the good things. First of all, I was here. I knew full well that I wasn’t in the best condition to compete, but I competed. I showed up, and my being there was a testament to my drive and commitment to this sport and my own health. 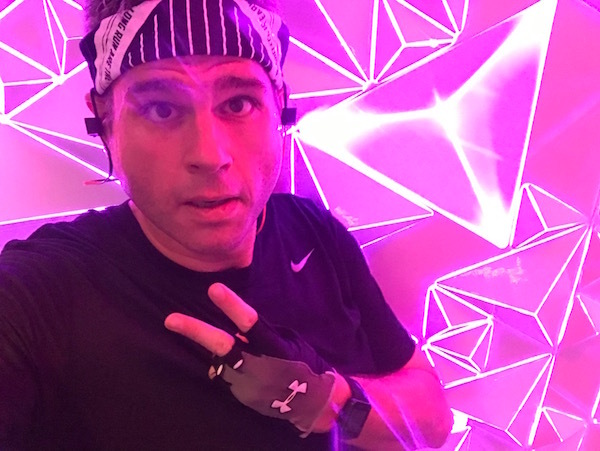 I thought about how far I had come, seven years into my stair racing career, to the point where I don’t even flinch at the prospect of racing a vertical mile. There was a time where every stair race intimidated me, but now, my attitude is bring it on! I still get nervous at races, because I want to do my best or set a PR, and not because I don’t think I can handle it. I’m a warrior, competing in my 66th stair race, with many more to come. I noticed that my headache had gone away, and shortly after that, realized it actually hadn’t gone anywhere – it was just that so many other parts of my body were hurting, too, so I didn’t notice it. For more info on the logistics of the Dallas Vert Mile, check out my recap from last year. I kept climbing, and starting focusing on what was happening around me. I was getting passed left and right, much more frequently than I was passing people, and by the fastest people in the country. There was an epic battle happening, and I was in the midst of it, with superstar athletes duking it out for the fastest times. There were a few moments where all I could hear were my own breathing, my feet connecting with the steps, and the low, unending rumble created by all of us, racing up metal stairs, reaching for more, pushing through exhaustion, not settling for anything less than everything we had. It was absolutely thrilling, and I tried to feed off that energy as much as I could. What’s more, so many of those superstars whizzing by me were friends, so there was never a period of more than a few minutes, during the entire race, where I didn’t see someone I knew. I cheered them on; they cheered me on. There were pats on the back, high fives and fist bumps. This race is a challenge, but being in the stairwell with buddies and role models is what keeps it from being a slog. Looking down the side of the stairwell. It’s a long way down! By this point, any rhythm or semblance of pace was gone. I was doing anything I could to keep climbing, keep moving, keep lifting one leg, and then the other, for what seemed like an eternity. I was moving slow, but I wasn’t going to stop. I couldn’t stop. I wouldn’t be able to look in the mirror had I quit, and I wouldn’t be able to face those who look up to me. It simply isn’t an option. So I kept climbing. My hand was so shaky and sweaty and I nearly cropped myself out! I knew, as I started my 10th climb, that I wasn’t going to finish all twelve. The rules state that you have to start your 12th climb before the two-and-a-half hours are up, and it just wasn’t going to happen. But I kept going. 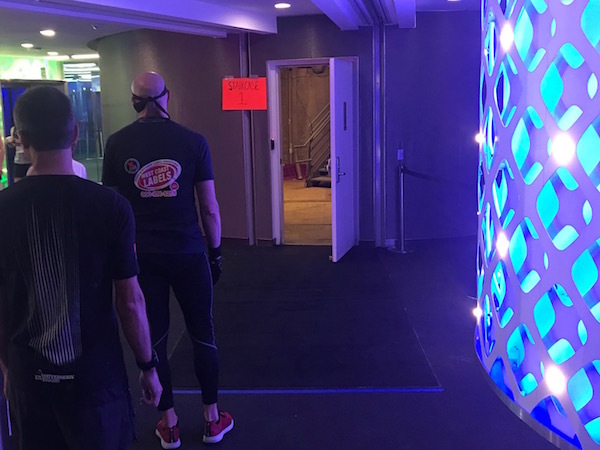 One of the many awesome things that the organizers do at this race is make a sign for every single participant, and hang them in the stairwell. Pretty sweet! 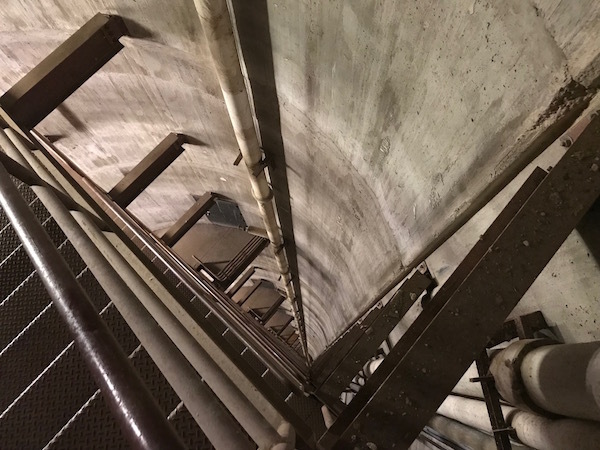 I was halfway up the stairwell, on my eleventh climb, when I reached my 2.5-hour limit. A few tears rolled down my cheeks as the disappointment set in. I didn’t achieve what I had come to Dallas to do. So I set a plan in motion. I decided to try to sneak in for a 12th climb, even if it didn’t count officially, just so I could say I finished all 600 stories. There’s a manned timing table you pass to enter the stairwell, so the plan was for me to play dumb, and pretend my time was still going. But Lonnie, who owns the timing company, was paying attention, and I was stopped before I could enter. My race ended in the lobby, with eleven climbs done, and one climb forever out of my reach. 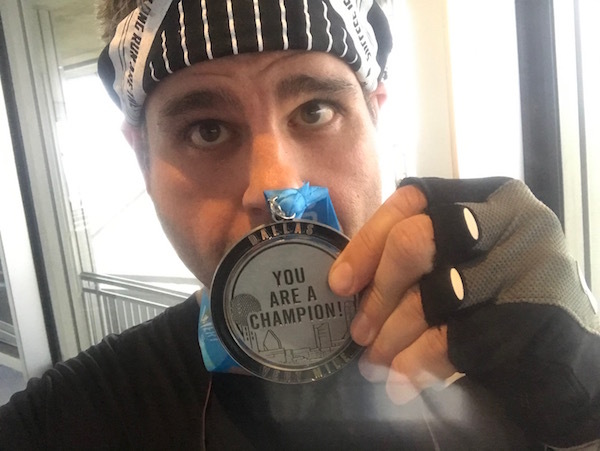 I was in the lobby, but the finishers medals were at the top, so I got in an elevator, and after riding it down 11 times, I finally rode it up. The finishers medals are outrageously cool: sparkly and colorful, with a spinning center section. And there’s a great saying on the back, too. The lingering initial disappointment started dissipating as I soaked in the view. 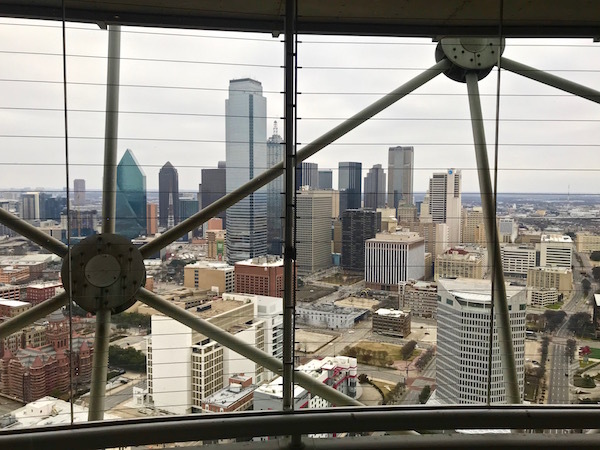 It was a grey morning, but Dallas still looked incredible from the top of the Reunion Tower. As the official times started rolling in, the disappointment was forever replaced by pride. What an incredible day! 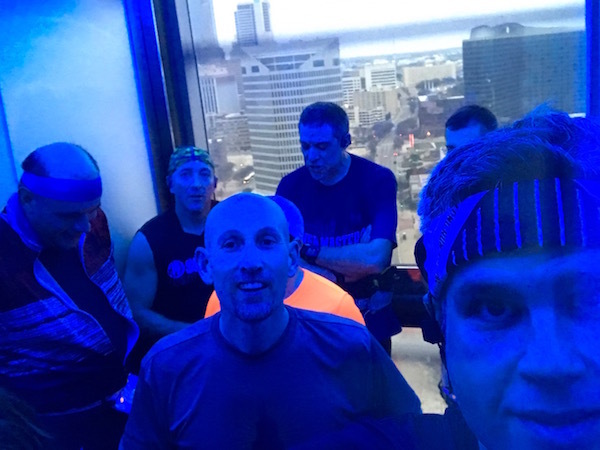 I had raced up a 50-story stairwell 11 times. 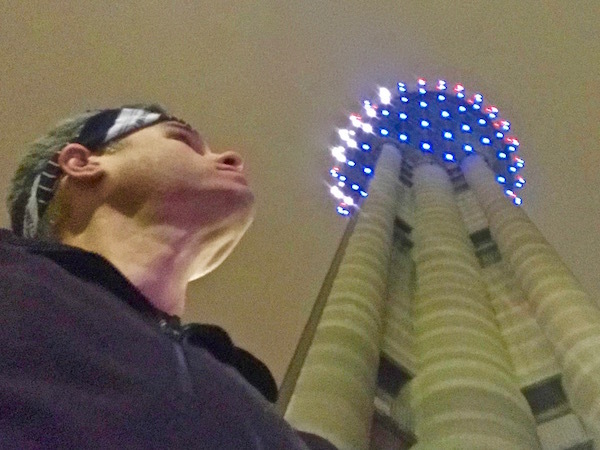 That’s 550 stories – and 8,877 steps – climbed in one morning. The only time in my life that I’ve done more stairs at one time was at this event last year. My cumulative time in the stairwell was 2 hours, 10 minutes, and 24 seconds. Over two hours of stair climbing! 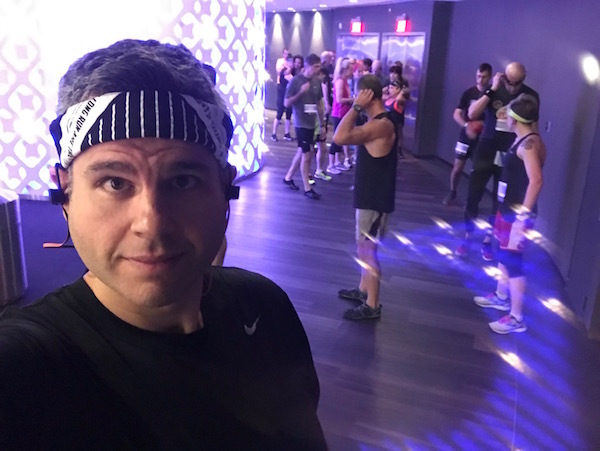 During the race (including the elevators down), my heart rate averaged 158 beats per minute. It maxed out at 178 beats per minute, during my second climb. According to my heart rate monitor, I burned 2,601 calories! I finished 112th out of 150 racers, 72nd out of 86 men, and 20th out of 21 men in my age group (men 30-39). During the race, volunteers give you a sticker every time you reach the top, and you stick it to your bib as a way to keep track of your climbs. Last year’s bib has 12 stickers; this year’s bib has 11. 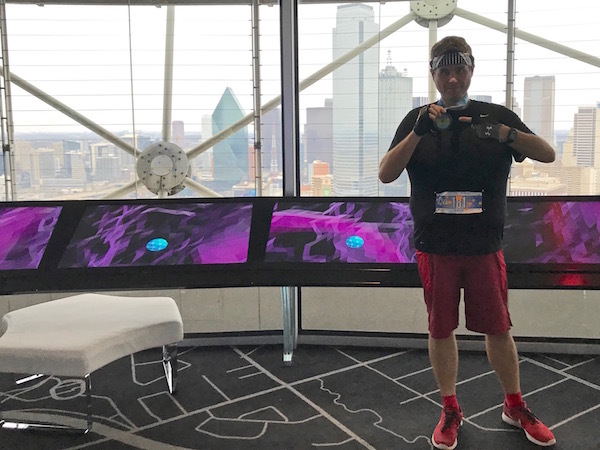 Add in the two climbs I did during the 2015 Heroes Memorial Climb, and that means I’ve now raced up the Reunion Tower 25 times! I finished the Dallas Vert Mile bummed that I had come up short. Now, two days later, I know the opposite is true. It was an amazing way to kick off my 2019 race season and a powerful reminder of my strength, abilities, and fortitude. On to the next challenge! This entry was posted on Tuesday, January 15th, 2019 at 12:06 am and is filed under Uncategorized. You can follow any responses to this entry through the RSS 2.0 feed. You can leave a response, or trackback from your own site. 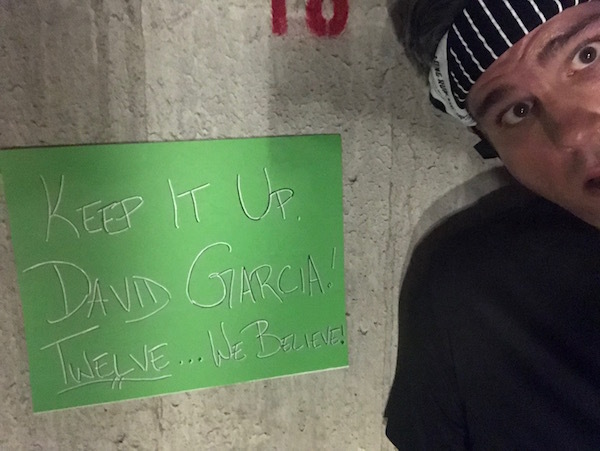 David, please know that I seriously mean it when I say that I always love being in the stairwell with you! I agree with what you said, it’s a great climb because we are with our friends and we get to see the top climbers racing, something we don’t normally get to see you in a one time event. Right back at you, Karen! Seeing those top folks flying by is literally one of my favorite parts of this race.